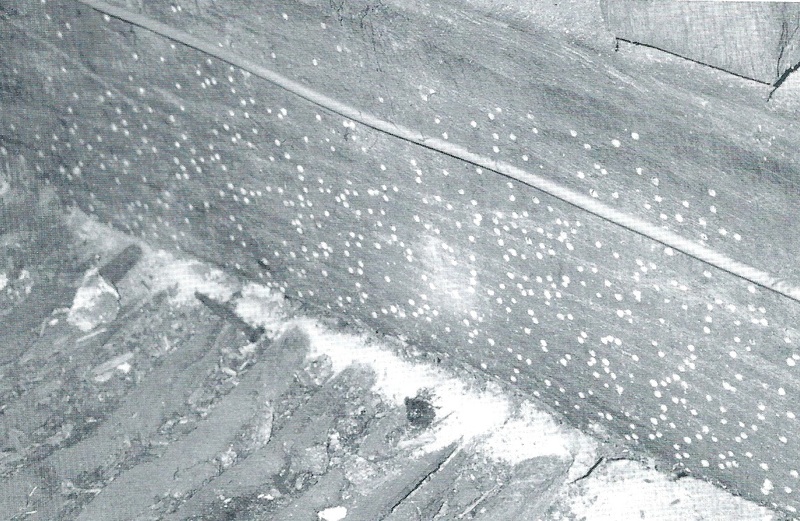 Woodworm in historic structures is not THE plague that is often suggested, it is also frequently misdiagnosed and inappropriate treatments proscribed. The most common infestations are from the Furniture beetle (anobium punctatum) and the Death Watch beetle (xestobium rufovillosum). The conservation world is very much opposed to many of the solutions proposed by the standard remedial companies. All the independent research carried out by conservation bodies suggests that these methodologies are in many cases often unnecessary, ineffective and destructive. Unfortunately for the home owner, they will frequently find themselves forced into these unnecessary treatments by mortgage lenders and surveyors unless they have the expertise of a good conservation architect or engineer. Regrettably as in the Dry rot treatment, most of the building industry's representatives(outside the conservation professionals at least), I.E. the regular builders, architects, surveyors and engineers have largely left the diagnoses and treatment of woodworm to the Remedial industry, who certainly have a direct conflict of interest in that they are usually asked to both diagnose and treat the problem. It could also be said that most would have little interest knowledge or concern for the preservation of original historic fabric of a building. As a result the wholesale removal or chemical treatment of timbers is often the result, along with the destruction of original materials and the replacement with what is usually inferior timber. These insects thrive in moist environments but once the moisture content of timber drops below 15% they can make little progress and below 12% they will not survive at all. Most homes these days are kept at a level where timbers would be kept within these parameters. Old timbers, from the 19th century were largely cut from mature natural forests and therefore contain a large proportion of HARTWOOD, this is the inner part of the tree and it is the SAPWOOD, the outer part of the tree that is susceptible to insect attack. 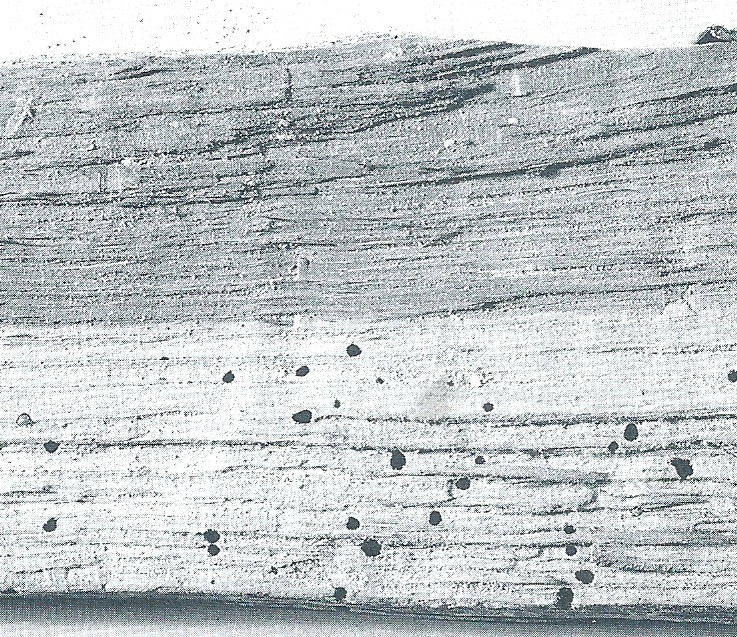 So it is not uncommon to see woodworm on one side of the timber, the sapwood, and non on the other side the hartwood. Modern timber on the other hand is largely from new growth commercially planted forests, this fast growing timber, when harvested, is mostly sapwood and therefore very vulnerable to insect attack. The result is that old quality timbers are often replaced by new far inferior quality timber, so a correct diagnosis is essential if you are to avoid unnecessary destruction of important elements of your building. OldBuilders Company understands the correct methods to diagnose and treat historic timber. A good conservation engineer or architect can help too. If you have a woodworm problem, please call us to discuss what we can do for you, please also consider using our CONSULTATION service, we don't offer you a free survey, but we do offer you our 35 years of experience in dealing with these problems..
while the lower part is sapwood and is well infested. Below photo: shows the fresh sawdust from recently made exit holes.